← The G8 protesters – who funds them? Three pieces in the Daily Telegraph recently have caught my attention and, collectively put a challenge to our ambitious Home Secretary, Theresa May. 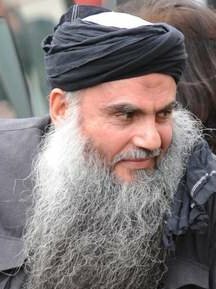 Despite her best efforts, Abu Qatada remains in this country, thanks to the European Court of Human Rights and we now learn just what we have all paid as taxpayers to provide Abu Qatada with legal aid, not to mention his diet of UK benefits over the last 20 years. The Daily Telegraph of 15 June answers a question I have been asking for a long time in a number of ways. Apparently, we taxpayers have funded Abu Qatada’s legal aid bill to enable him to remain in the UK to the tune of £900,000 while paying our legal bills to have him removed for a further £900,000. What a joke. If he wins, UK taxpayers lose; if he loses, UK taxpayers lose. Add to this £1.8 million the costs of keeping him in prison, monitoring his movements when he is out of prison (£100,000 per week) and the benefit bill for him and his family over the last 20 years and the Telegraph makes it £4 million. It is time this peddler of extremism was kicked out of the UK. Sunday’s Telegraph carries some politial gossip about Theresa May and her ambitions to succeed David Cameron in the top job. Back in March of this ear, she addressed ConservativeHome’s Victory 2015 Conference in a wide-ranging speech that went well beyond her Cabinet remit as Home Secretary. More recently, she has addressed the Reform think tank in a way that greatly exceeded her Home Office brief with her personal views on the economy, on education and on overseas aid. She is know to have attracted Michael Gove’s ire for what he saw as naked ambition while she has apparently attracted the support or, perhaps it is only the notice, of Michael Fallon, Minister of State for Business & Enterprise and MP for Sevenoaks and someone said to be close to DC. My challenge to Theresa May, in addition to getting Abu Qatada on a plane double quick, is to sort out our legal aid bill. Public accountability should apply here and we should be entitled to see, month by month, what the country is spending on legal aid, the justification for this expenditure and the final outcome of proceedings.